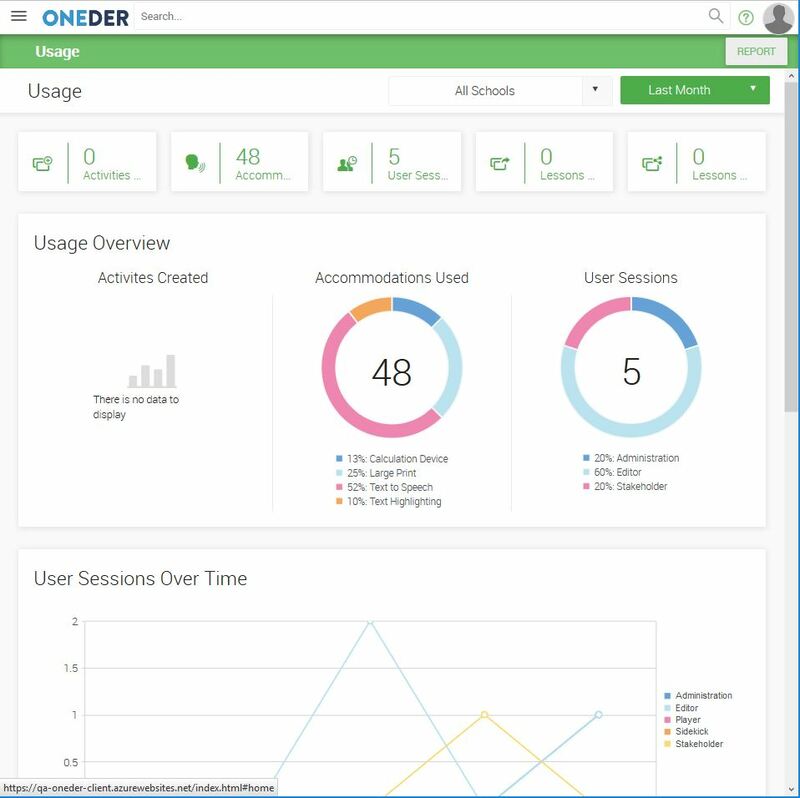 ONEder includes two reporting functions to provide system admins with insight into who is using ONEder in their district, how often, and what they’re doing while logged in. Licensing: Lists your license Purchase Orders (POs), how many licenses each contains, allocation and assignment numbers, and PO expiration dates. Metrics: A school-by-school breakdown of the total and active number of accounts in each user role. Users: Provides a school-by-school list of users, with a full readout of all the information contained in their account profile. Select a Report Type and the Schools to be included, then click GENERATE to export the information to an Excel spreadsheet. The Usage reports, also accessible from the hamburger menu, provide a detailed dashboard with a wide selection of ONEder user activity, including overall number of activities created, accommodations used, user sessions, lessons published, and lessons shared in your district. The output can also be filtered by school or timeframe. Clicking on the REPORT button in the upper-right corner of the screen will generate a PDF version of the Usage dashboard reports, which you can save to your computer by clicking the DOWNLOAD button.